What Can You Do So Your Face Won't Get Oily? Primer can help you get the most our of your foundation. If you already make the effort to put on makeup, you might wonder whether you should use a primer. A primer is like a base coat for makeup. Apply it before putting on your makeup to help products go on more evenly and stay on longer. 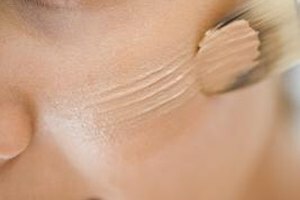 Primers -- worn under foundation, eye shadows or concealers -- have their benefits and some disadvantages. Primers create a smooth, even surface. They prep your face the way a painter preps a canvas. That smooth base makes it easier to apply foundation or eye shadow evenly, and prevents makeup from settling into fine lines and wrinkles. If you have blemishes or oily skin, a primer absorbs oil throughout the day to keep you from getting shiny. Foundation primer is not the best choice for a fresh, natural or dewy-looking complexion. It adds another layer of product to your face and maximizes your foundation, so none of your own natural skin shows through. A full-coverage foundation used with a primer can look very heavy. If you have good skin, you can probably skip the primer. New York Magazine: The Cut -- Primers Help Oily Complexions, But Which One Works Best? Sophie Southern has been a freelance writer since 2004. Her writing has been featured in "JPG" magazine and on Zlio.com. Southern holds a Bachelor of Fine Arts in photography from the School of Visual Arts. Can You Use Foundation Primer As Eyeshadow Primer?